Don’t be a psycho. Use commas. I want you to know, the use of proper grammar in this post is brought to you by the good people at Grammarly, who offer a fantastic grammar check for all of your internet writing. I realize I am guilty of misusing the English language and peppering my posts with – ahem – slang, now and again. I am also certain that with the sheer number of posts produced in a year, there are bound to be numerous mistakes in punctuation, spelling and more. The difference is, I actually know how to write and spell a grammatically correct post in the English language. I also edit, re-edit and triple check my posts whenever possible. Judging by what I see littered throughout the internet (artistic license aside), I’m thinking there are a lot of people who don’t do this. Because these people are spreading the sickness of illiteracy, and this sickness could possibly destroy the human race you guys! I’m serious! What will our children’s children think when they read the words “Srsly,” “Phablet” or “Twerking” in the Oxford dictionary in the year 2354? They’ll think the reason the human race is dying is because we forgot how to spell or communicate properly. These things are always preventable. But when that big homeland security chief in the sky messages down to the control tower guy just before an alien attack with something like, R frce flds up?, how is control-tower-guy supposed to know he is asking about force fields? I would think he was talking weather, as in, “Are fierce floods up this year?”. You see my point, right? For those rare instances when time won’t permit me to check my work, or I’m not quite sure how to write “I’m EXHAUSTED from seeing all of these F%$#ING letters on the screen” in proper English, I simply get help, (or hire an editor). Please CHECK YOUR WORK (or ask someone to help you check your work). We’ll all be happier. All snafus and gaffs will be avoided; human race annihilation averted. 5 Responses to "Don’t be a psycho. 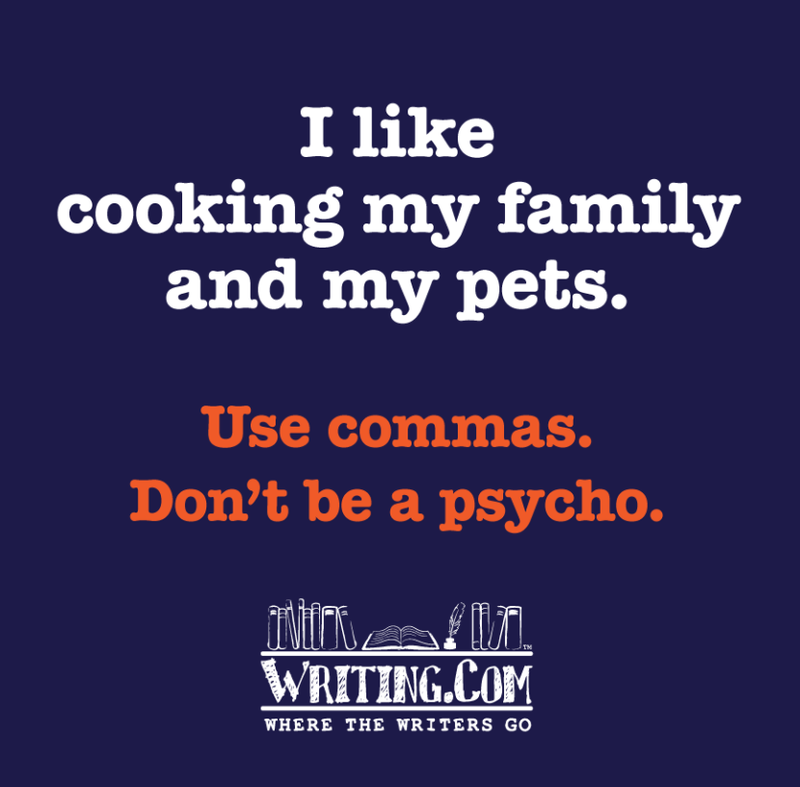 Use commas." YAY! So glad someone FINALLY said something about this! Ha ha! You go girl! You are welcome Wak! I had to get it out, before I suffocated. MsCheevious recently posted…Don’t be a psycho. Use commas. Wholeheartedly agree with striving for better word structure and preserve the beauty of the English language. Yes please Kath! #SaveTheHumanRace! Mmmmppphhhuuuhhh! !